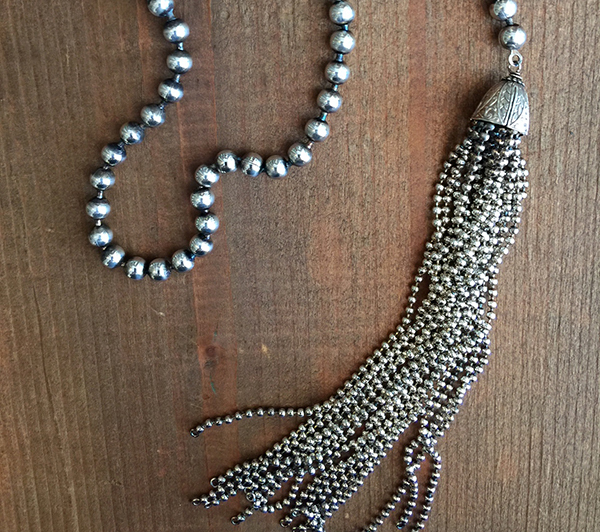 Another addition to our ball chain design line, this one composed of a 14.5 inch 6mm ball chain lead with a tassel element. 16 strands of 2.1mm ball chain are capped with a die struck engraved brass element, and each strand features a soldered loop for embellishments. Use singly as the base for a shorter necklace, or in pairs for a long lariat, adding your own, linked, strung or knotted beads. Sterling clad, by the piece.